Tableau loves well-structured data. We'll show you how to best organise your data to make analysis in Tableau a breeze. If you have data files, you can use these tips to get them ready for Tableau. If your data lives in a database and you're having trouble accessing it, check out our drivers page or contact your internal data expert for access. 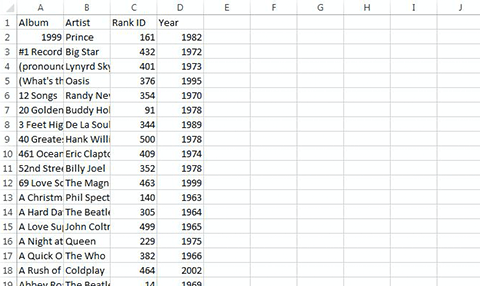 For best success with Tableau, your data should be formatted like a table or spreadsheet as seen here. If your data needs to be prepped before you use it, read on for details on Tableau’s built-in tools to help. Tableau Prep will get your data analysis-ready by helping you quickly and confidently combine, shape and clean your data. The flexible, visual experience of Tableau Prep gives you a deeper understanding of your data. It makes common yet complex tasks like joins, unions, pivots and aggregations simple and visual. With your Creator licence, you get access to Tableau Prep. Analysing data stored in a crosstab format can be difficult. When one type of information is stored in multiple columns, pivoting the data from columns to rows makes the data much easier to work with. Tableau's native pivot option makes this operation easy. Each field has an icon that represents its data type. This helps Tableau understand how the data should be formatted, interpreted and used. For example, geographical fields can be mapped and Boolean fields contain only two possible values: true or false. You can change the data type by clicking on the icon. Your data may contain multiple units of information in a single field. A common example of this is the first and last name of a customer in one column. In these cases, it’s often easier to analyse the data if you have a column for each piece of information. You can use split or custom split capabilities in Tableau to separate the values into multiple columns. The Data Interpreter lives within Tableau Desktop. After connecting to data, if Tableau detects sub-tables in your data, you'll be presented with the option to turn on the Data Interpreter. The Data Interpreter will draw out sub-tables and exclude any extraneous information. Check out suggestions for other common formatting issues that can make analysing your data in Tableau challenging. Use these popular public datasets to explore in Tableau and to see more examples of well-structured data. Explore when albums hit the top 500. 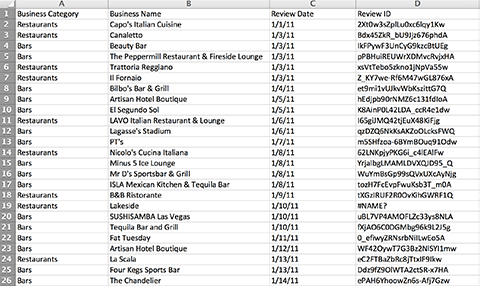 Discover what restaurants in Las Vegas have the highest (and lowest) Yelp reviews. What fun facts will you find out about the 2012 Summer Olympic medallists? 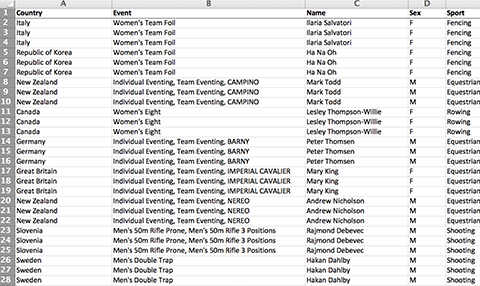 Criteria such as home country, event, medal and gender are included in the data. Courtesy of The Guardian. Raw survey data can be tricky to handle. One of our Tableau Zen Masters, Steve Wexler, makes it easier with these detailed instructions.